Not this kind of juicer! We are back home after a intense week of traveling around the country to attend family affairs. 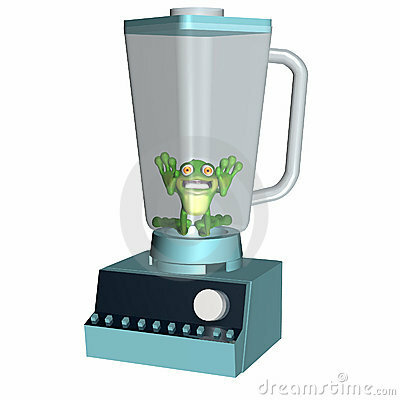 I was pleasantly surprised to find one of Duncan McCree's Hex Frog Juicers in my mail box. This circuit card provides the logic to power six track elements, usually the frog of a turnout, but it also can be used in a reversing section. The unit senses a short and reverses polarity very quickly, usually faster than the DCC booster circuit breaker can trip and quick enough that sound units operate without interruption. It will not correct a short due to mechanical failure or external factors, like a metal tool on the tracks. But it will work great for controlling the polarity of the frogs on my layout and on the turn tables. Thus I don't need mechanical switches connected to my turnouts to route power. The only draw back is that the system only works for DCC, so I will need to convert my locos to DCC to make these work. I am looking forward to getting these installed. I started adding the terrain to cover the return track. 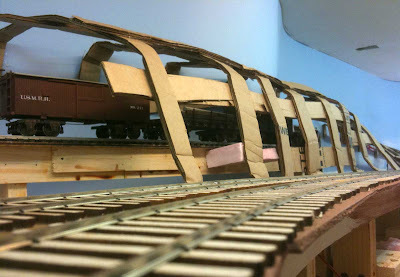 Using hot glue and cardboard strips I built up the contours. There will be a rock cut at the choke point between the tracks. Then the hill will gradually flare to a shallow slope on both sides. or I may just daylight the track for a brief section. At the far end I added Accokeek Creek. By adding Accokeek Creek, I will have included all the major water crossings from the prototype. This was the site of a 150 feet trestle bridge, but I didn't want to add another bridge, so I plan to install a culvert. 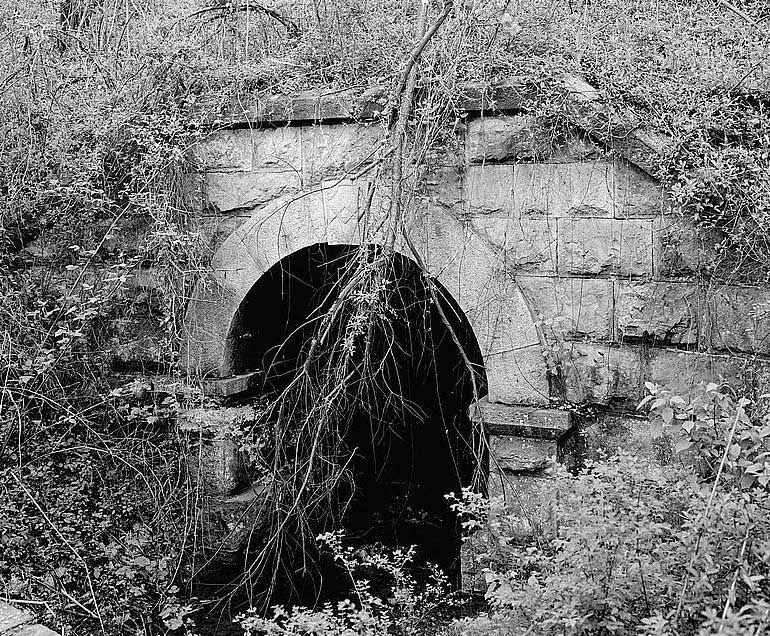 Again I'll look to Crozet for inspiration and use a culvert design that he used on the C&O Mountain Subdivision. The white building shows the site of a future water mill. I am looking at several possible prototype structures to use in this spot. 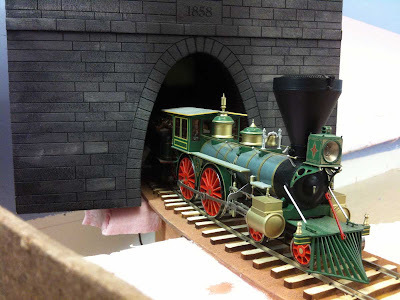 Scott Mingus posted some photos of dioramas of the railroad at Gettysburg on the eve of the battle. The links are here and here. 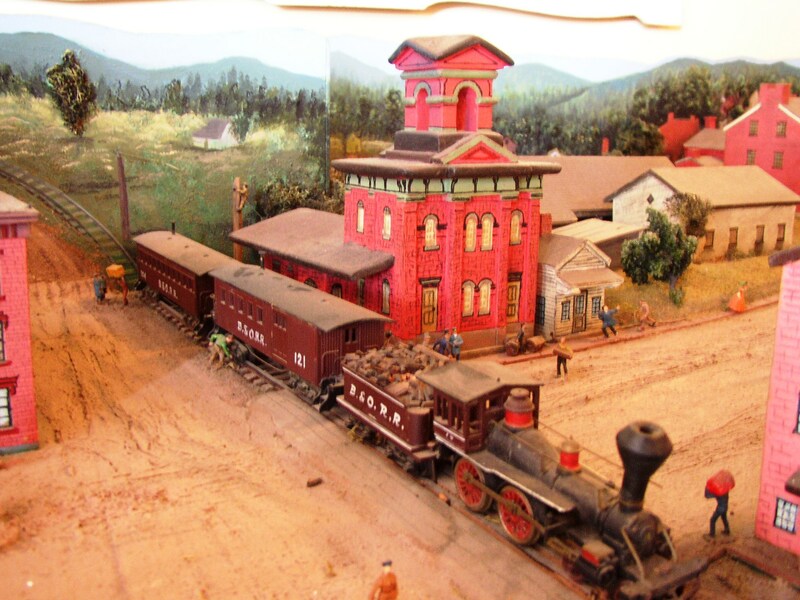 The upper diorama,which has the correct color for the station, is located in the restored Gettysburg Railroad depot on Charles Street. The lower diorama is on display at the Union Drummer Boy shop on Baltimore Street in Gettysburg. Looks like more a couple more reasons to visit Gettysburg. I did some work with Scott several years ago in photographing some dioramas I built to illustrate his war gaming books on Gettysburg and Antietam. You can see some of the photos at my American Civil War in Miniatures web site. I believe the books are now out of print, but you can probably find them at war gaming shops or conventions. Wiring... a part of the hobby I don't really enjoy, but it must be done. 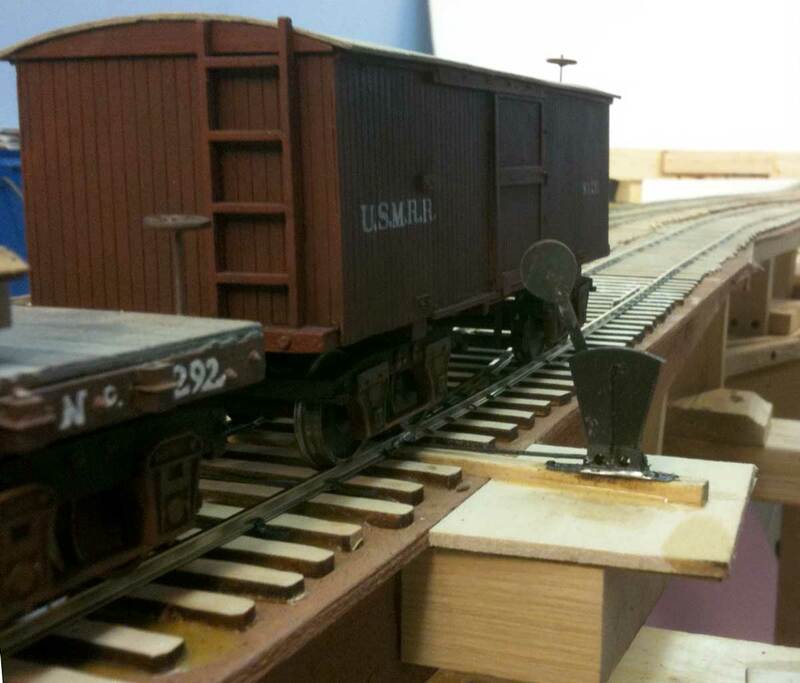 Now that tracks have reached Aquia Landing, I spent a good part of the weekend cutting gaps, soldering feeders and running bus wires. I just about have the Brooke Area wiring finished. Trains were running from Brooke to Aquia Landing on flex track. The flex track will remain in the hidden return track, but will be replaced at Aquia Landing. 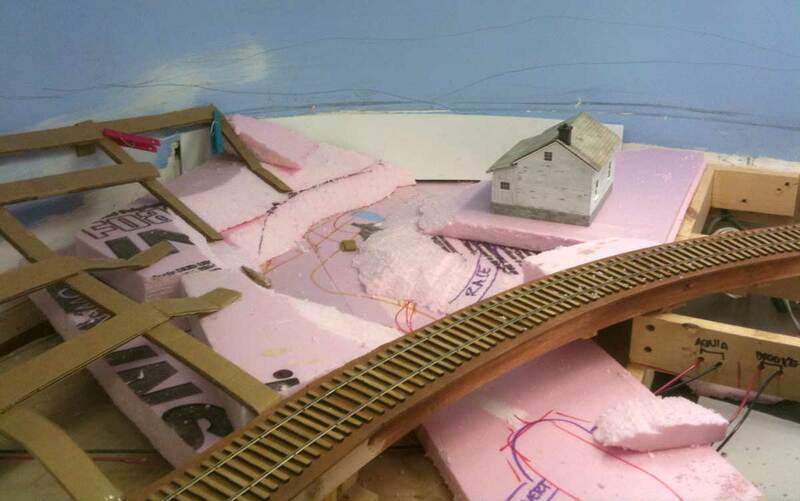 I started adding roadbed in Aquia, but decided to finish the wiring at Brooke first. Brooke siding and the hidden track will be one booster. Aquia Landing and the rest of the layout be be on separate boosters. That makes a total of three. But I can try using only one initially. The wiring is set up so that it will be simple to add boosters in the future. I did some test running from Aquia to Brooke looking at different ways to scenic the back track. Normally my objective is to minimize hidden track, but in this case the best solution really is to hide the return track under a ridge. My wife suggested an alternative of some additional tunnel portals so that a portion of the return track would be visible. I made a stone portal for the southern end of the tunnel. Once we saw how big the tunel portal was, she aggreed that more tunnels would not look right in the space available. Once wiring is done I can rough in the terrain forms at Brooke and test the hidden return track to see how it will work in terms of operations. The idea is to force the operators to stop once they enter the tunnel and wait about 5 minutes. This simulates the long run from Aquia Landing to Brooke. This is the first, and probably the only, tunnel portal for the layout. The freelanced model was based on the original western portal at Blue Ridge crossing designed by Crozet. 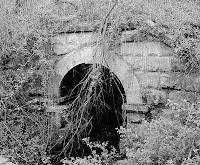 I added a date of 1858 to the face of my tunnel portal. That helps set the time frame for visitors. 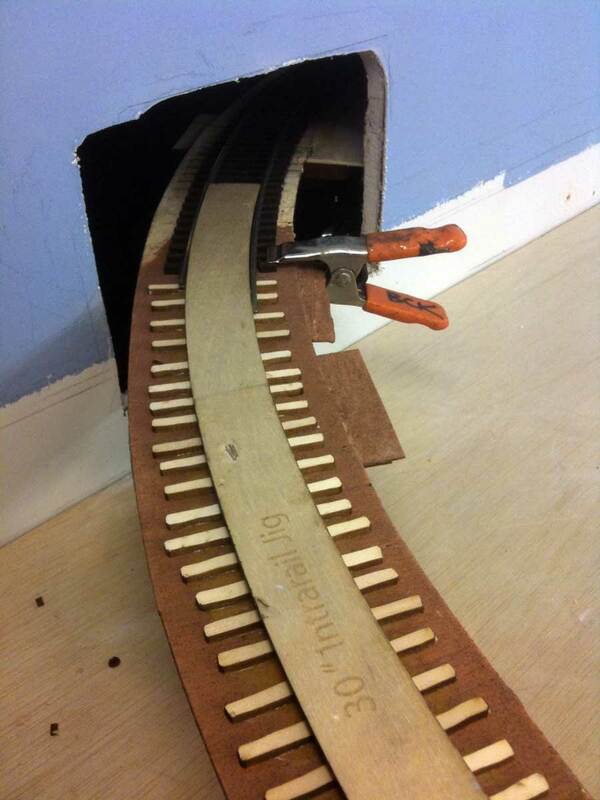 The tunnel is laser cut using architectural cardboard. It has a slight stone texture. The brick liners are G scale brick plastic card I had on hand. The overscale bricks are not too noticeable in the tunnel lining. I gave the stones a coat of black spray then added the brick liner. I did a quick dry brush and dull cote. I'll touch up the paint once things are dry. You can see one of the black feeder wires in the lower left. 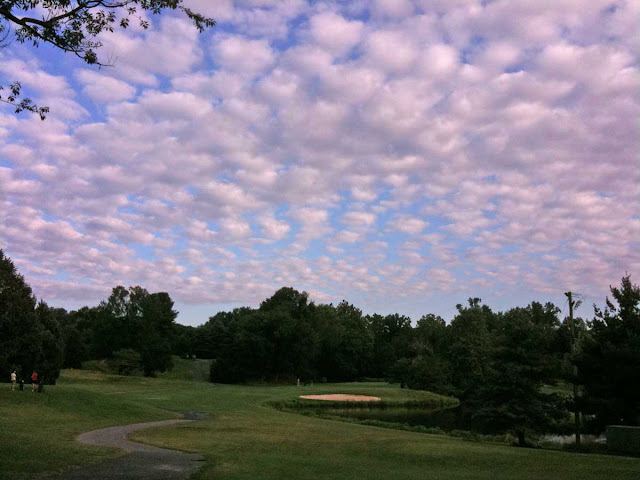 This was the sky that greeted us on the golf course Sunday Morning. I made me think of Monet, maybe that's why my golf game was so bad. I finished gluing the roadbed pieces to their risers for the hidden track that runs behind Brooke to Aquia Harbor. Using Atlas code 148 flex track I soldered three lengths together and loosely installed them in position. 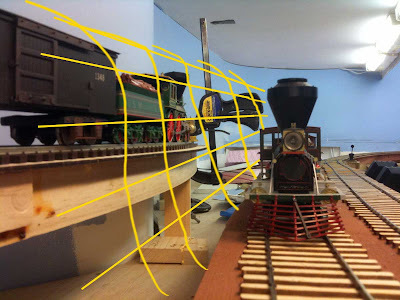 (I forgot what a pain flex track can be to work with especially on tight curves. 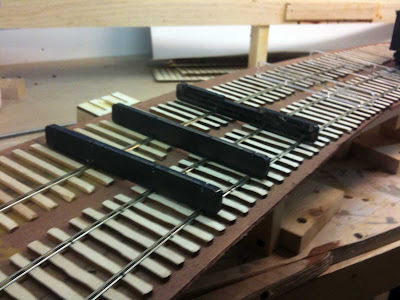 It weren't for thousands of spikes to hand lay, I'd never use flex track again). The first photo shows the tight spacing of the return track compared to the visible track at Brooke. I think the best scenic treatment is a cut through a hillside allowing the upper track to be hidden. 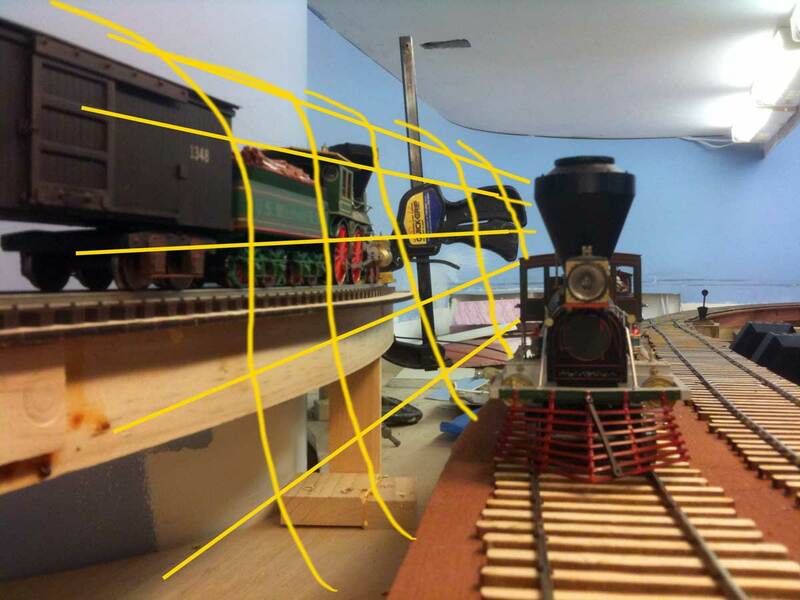 The yellow lines show the approximate alignment of the terrain for the future cut. The additional challenge will be to make this section removable for maintenance. This photo at the right shows the transition between the Atlas Flex Track and the hand laid section as it enters the closet. The 30 inch inter-rail track curve template helped get everything lined up. 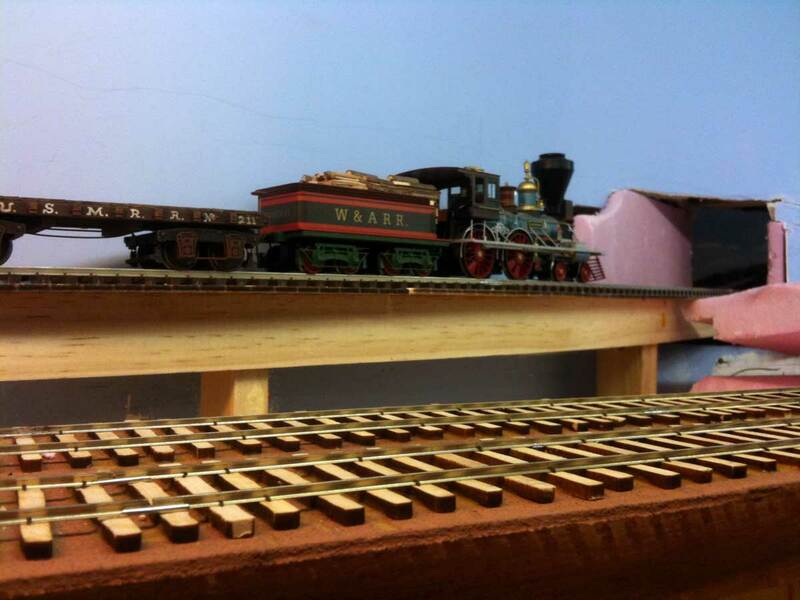 I still need to fashion transition pieces to allow the code 148 and code 100 rail sections to line up both at the top of the rails and laterally. The tie heights worked out to be about the same, so I'll need to add ties to the wood sections and sand them on an gradual incline (vertical easement) to allow the tops of the rails to line up. Eventually this scene will be hidden by a tunnel portal. I will use the portal at Crozet as my prototype inspiration. The photo at the left shows an HO version of the tunnel portal that I cut with my laser cutter. There will not be a tunnel at the Aquia side of the hidden track. The hole in the wall will be disguised by a warehouse structures. The US Mail also delivered us a surprise - the solid wood hull from my Bluejacket 1/48th scale Smuggler kit minus the section below the water line. My brother Rob in Florida took it home with him last week to cut on his Inca band saw to make it a waterline model. He did a great job as the cut is quite smooth and perfectly level. He hand planed the base to smooth it out and to make it flat using a Stanely no. 5 Jack plane at first and then a custom made infill smoothing plane. He also eliminated the carving stubs that were on the ends of the hull. 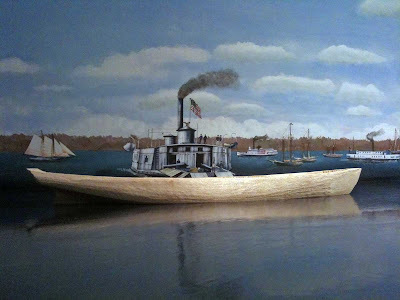 The smooth bottom makes the machine carved sides and deck of the hull look quite crude in comparison. Here the model hull is sitting on the infamous Minwax water surface at Aquia. Finishing this ship will be a fun project for next year. The hot weather was a perfect excuse to work in the air conditioned basement and I was able to get all the track installed at Brooke this 4th of July weekend. We did sneak out early on Saturday and Monday to play golf at the local course, and went to a nice cookout on Saturday night, but the real action was in the basement this weekend. BTW, the temperature never did hit 100, only 98. This is an overview of the siding at Brooke. I installed three turnouts and the track. The two sidings in the fore ground are curved. They came out nice and work well. I am starting to get a feel for what makes these things work properly. The curve in the foreground is 30 inches radius. 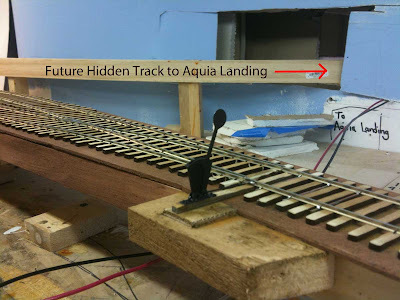 The hidden return track to Aquia can be seen popping through the wall in the left rear. This is the southern end of Brooke. Slightly above and to the rear are the splines for the future hidden track that leads to Aquia Harbor. I have some flex track for the hidden track so hopefully it will install quickly. The hidden track will be accessible with a removable section of terrain. I used Devcon two-part 5-minute epoxy to glue the switch stands to the ties. Combined with some spikes it makes a very secure bond. At one point my elbow knocked one of the the switch stands while driving spikes. The stand failed at the solder joint with the base plate, but the epoxy joint between the base plate and the tie held. It was a simple matter to re solder the stand. I wasn't sure if the heat compromised the existing epoxy, so I mixed a little more and built up a fillet around the base to reinforce it. The nice thing about building everything your self is that when you break something, it is easier to fix. I made some laser cut jigs for the track spacing in the section with two tracks. These jigs really helped when laying out the curved turnouts on the northern end. One problem I encountered was that the arms on the switch stands are too long and are interfering with cars as they pass when the turnout is set with the arm towards the track. I ended up unsoldering the targets, trimming the arms and then reattaching the targets. They will require some touch up painting. 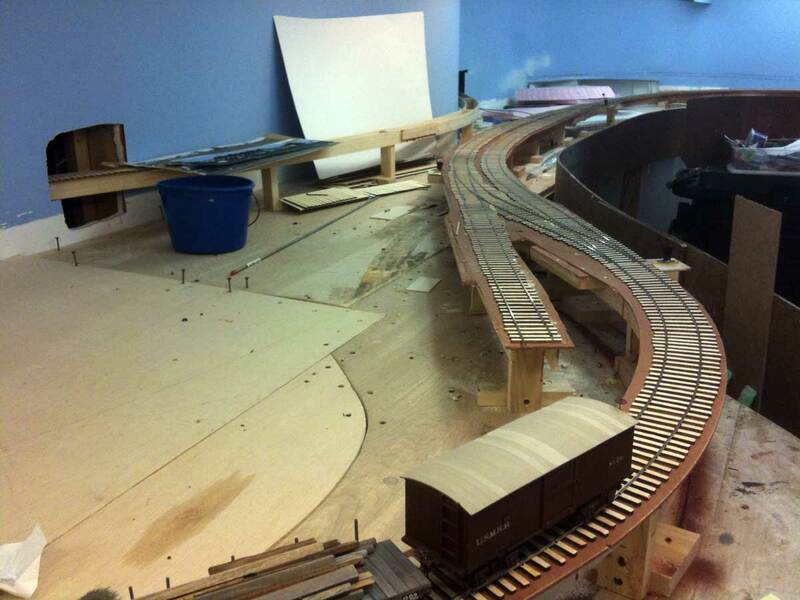 Now that this area is done, it won't be long before I'm installing track at Aquia Harbor. 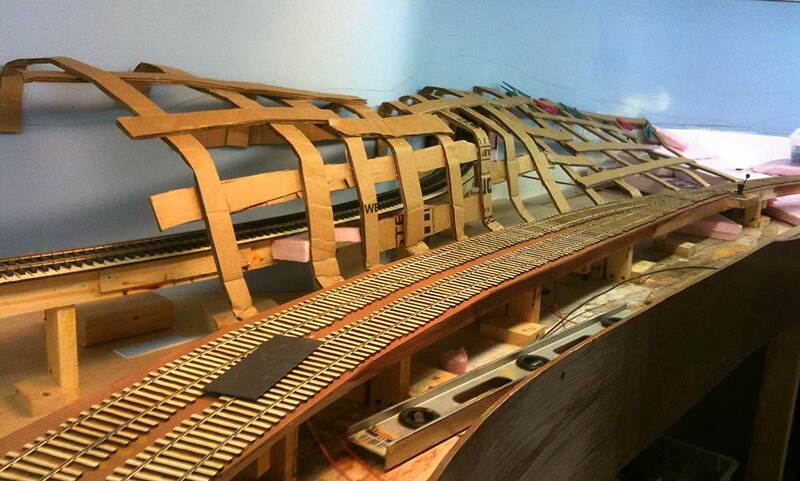 There still is a good bit of work to get the track operational, but the end of this phase is in sight.